As I noted in yesterday’s post, building a tiny PC is all about the order of parts installation. Choose the wrong build order, and you end up taking it all apart and starting over again. First installing the power supply, motherboard, memory, and CPU turned out to be a no-brainer. Adding the graphics card, SSD, and optical drive turns out to be a little trickier. Finally, using a sealed liquid cooler in this case just adds to the challenge. Oh, and don’t forget to attach all the motherboard connectors before proceeding! 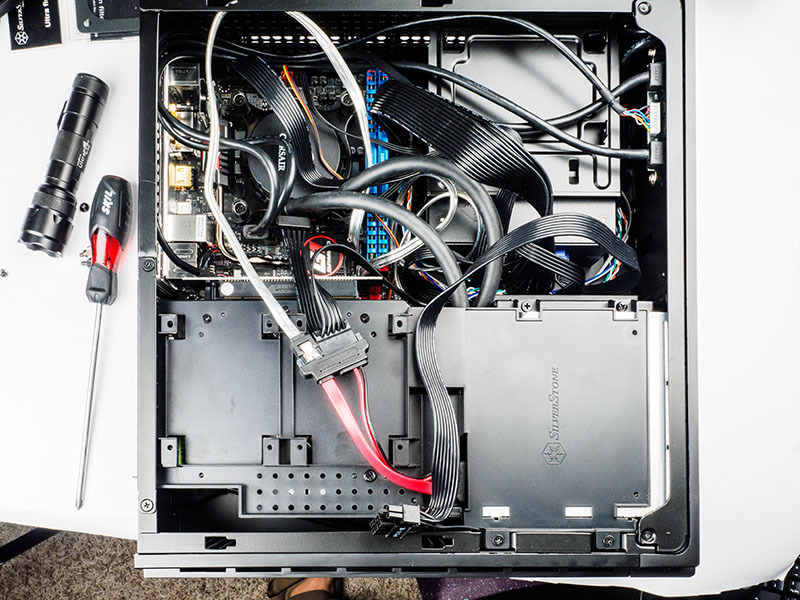 The ML07 uses a removable assembly to house the graphics card, optical drive, and SSD. Attaching the SSD and optical drive is pretty simple, but the graphics card requires a plastic brace obviously designed for longer cards. After a bit of fiddling, the graphics card locked into place nicely. Note the right-angle adapter on the left. 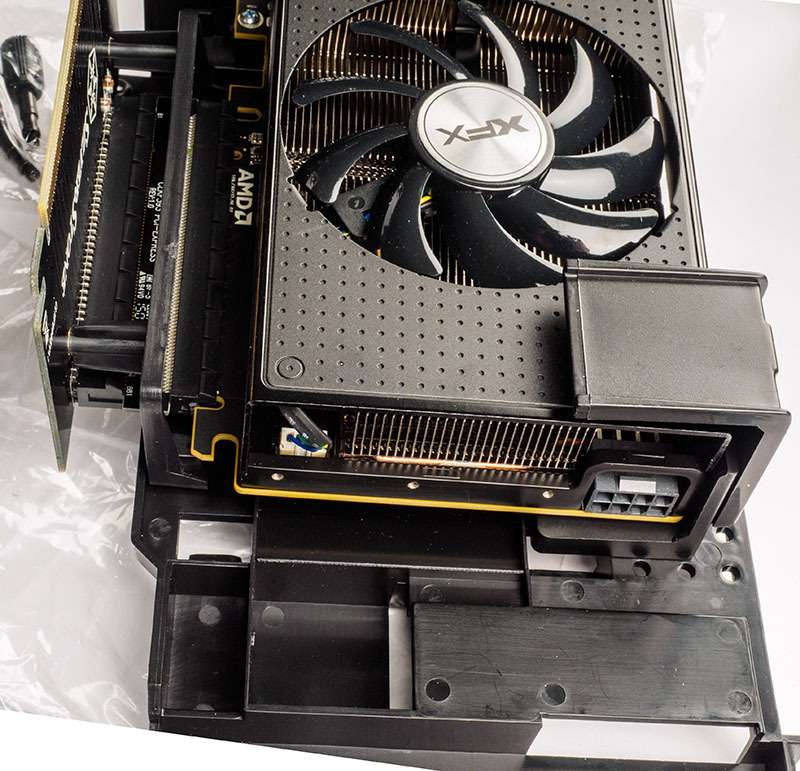 The graphics card actually mounts parallel to the motherboard, and requires both a PCI Express extender and a PCI Express right angle adapter. Attaching the optical drive required a desktop SATA to laptop SATA adapter, but I already had one on hand. 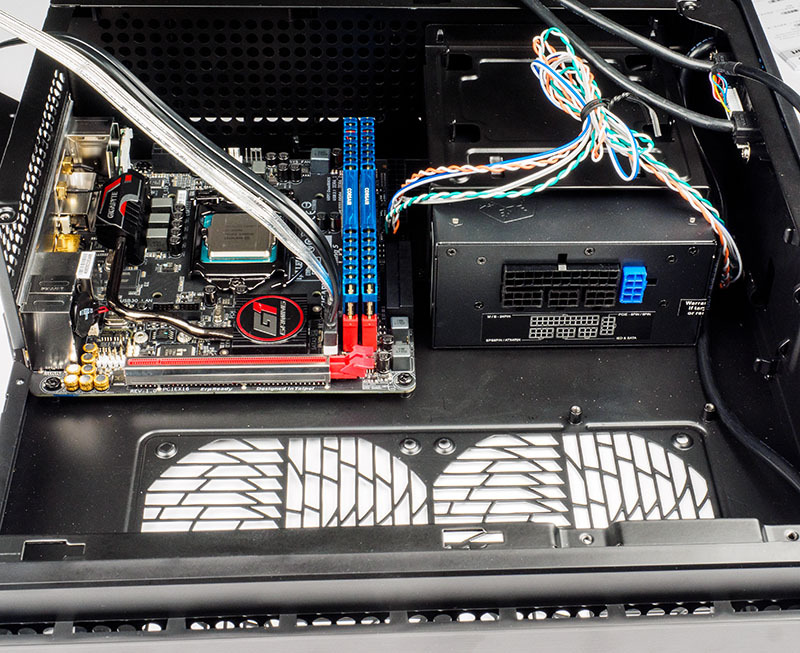 The real chore: installing the Corsair sealed liquid cooler. You see, the fan included with the cooler is too thick. I replaced it with a Scythe fan just 12mm thick. A 12mm Scythe fan replaced the original 25mm fan. It took some jiggling and adjusting to get the whole assembly to, well, assemble. The sealed liquid cooler hoses swivel, so can be moved a limited distance. The two liquid cooling hoses fit through small slots in the peripheral assembly bracket. The radiator for the cooler attaches to an existing cooling fan mount on the side of the case. The thinner fan made the biggest difference in getting everything to fit. Once in place and screws in, the whole affair seems rock solid. The system booted up normally, and the Windows setup went smoothly. However, I encountered one relatively serious glitch, however. The first XFX Radeon Fury Nano generated some serious artifacts when running games; the card ran far too hot, so I needed to replace it. The new card seems to run fine, however. I attached the rubber feet and use the system as a micro-tower. Yes, it’s really that small. and its become one of the regular systems we use in our weekly Friday Night Follies LAN parties. This turned out to be one of the more complex PCs I’ve built, mostly because of the extremely tight quarters inside the case. I wouldn’t suggest trying this as a first PC build. It required some experimentation to get the graphics card to fit properly, to find a new CPU cooling fan, and to discover the right assembly order. While building this tiny system is an exercise in frustration and patience, it’s also one of my more satisfying builds. 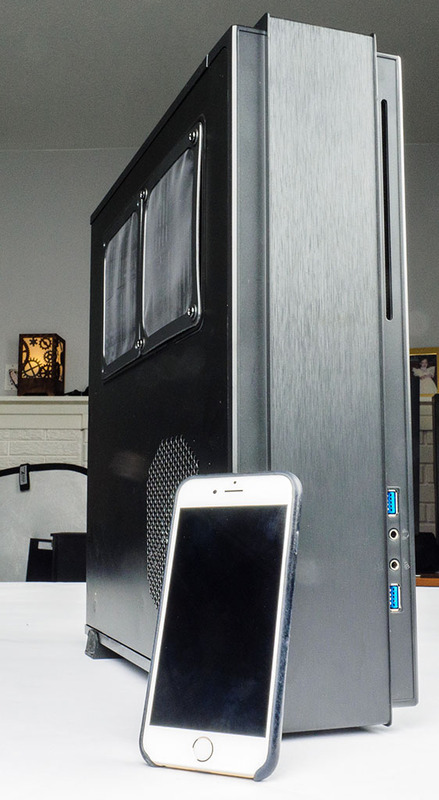 It’s very easy to build a mid-tower PC, given the state of PC parts standardization. Building a PC this small, and yet this full-featured, may be a test in patience, but it’s no less fun.